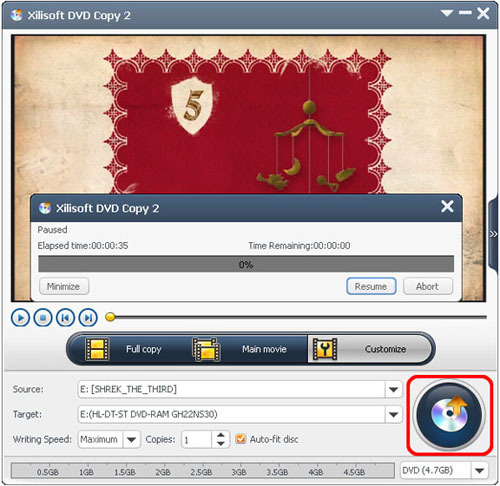 Xilisoft DVD Copy 2 is an extremely easy-to-handle DVD copy software to copy DVD movie perfectly at fast speed. 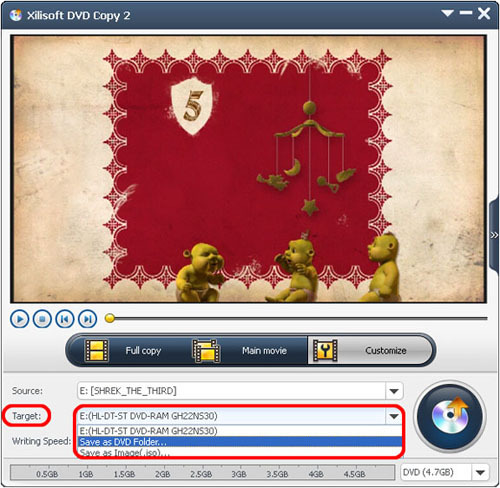 This DVD copying software can copy DVD movie in 1:1 ratio, copy DVD to DVD folder or ISO file, and copy full disc or main movie only. It's your best choice to copy and backup DVD. Firstly, download Xilisoft DVD Copy 2, install and run it. 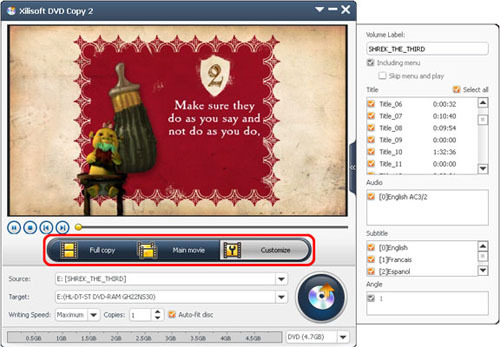 Three copy modes are provided: “Full copy”, “Main movie” and “Customize”. (1) Click “Full copy” button and open the “Advanced Settings” panel in the right. In this mode, the program will check all DVD titles, you can't modify. You can set “Volume Label”, preserve DVD menu, select “Audio”, “Subtitle” and “Angle”. (2) Click “Main movie” button and open the “Advanced Settings” panel in the right. In this mode, the program will select the longest title in default which you can't modify. 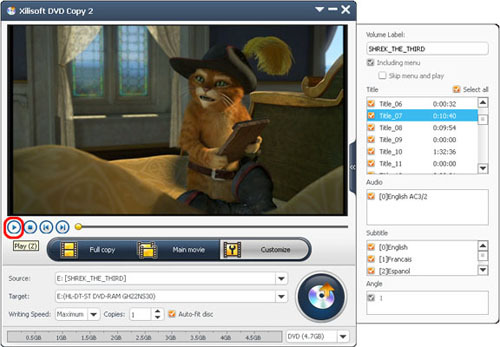 You are able to set “Volume Label”, preserve DVD menu, select “Audio”, “Subtitle” and “Angle”. (3) Click “Customize” button and open the “Advanced Settings” panel in the right. In this mode, you can check DVD titles that needed to copy. You can also set “Volume Label”, preserve DVD menu, select “Audio”, “Subtitle” and “Angle”. Click the drop-down button of “Target” to select a target. You can copy the source to DVD Disc, “Save as DVD Folder…” or “Save as Image(.iso)…”.